Below is a brief history of the current Parish, hopefully you will find it an interesting read. In 1066 Morcar (Earl of Northumbria) held the manor of Easington (this includes the hamlets of Kilnsea and Out Newton, as well as the hamlets lost to the sea – old Out Newton, Dimlington, Turmarr, Northorp, Hoton, old Kilnsea, Synthorp, Ravenser, Ravenser Odd), this was relinquished to Drew de Bevrere (a Flemish supporter of William of Normandy (William the Conqueror)) who after the conquest was rewarded with large areas of land in Northern and Eastern England, primarily in Holderness. De Bevrere held the manor of Easington until 1087 (fleeing to Flanders and disappearing from history), his lands were then given to Odo, Count of Champagne, who eventually became Count of Aumale. It went to the Aumale fee and passed to Burstall (Burstwick) (a cell within the Aumale abbey). Auburn, Hartburn, Northorpe, Monkswell, Monkwike, Waxholme, Dimlington, Turmarr, Orwithfleete, Tharlesthorpe, Owthorne, Hoton, Sunthorpe, old Kilnsea, Ravenser and Ravenser Odd — they all lie under the sea off the Holderness coast. In their time they had churches, fields, farm-houses and cottages, mills and ponds, but they were established on the boulder clay coast of Holderness, and their down-fall was inevitable, as the cliffs crumbled into the sea. It has been estimated that when the Romans were in Britain the coastline of Holderness was about three and a half miles further east than it is now. And when the Domesday Book of 1086 gave us our first full list of settlements the coastline was probably about two miles further east. Some of the villages named above still had open fields stretching out to the sea at that date. Their downfall was however predictable, and the retreat of their populations must have been anticipated, though the loss of good farmland, their only support, probably meant penury. Most of the collapses of these little communities went unrecorded, since they happened before regular written records existed. But the end of Ravenser Odd is a different matter, because it was associated with the Abbey of Meaux, near Beverley, and the monks kept excellent records. Ravenser Odd was a thriving, bustling sea port with streets and buildings at the end of a peninsula (a predecessor of Spurn Head) at the tip of South Holderness. At the height of its fortunes in the early years of the fourteenth century, Ravenser Odd was a town of national importance, supplying the king with two fully equipped ships and armed men for his wars with the Scots. The port flourished from about 1235, but by about 1340 it was being threatened by the inroads of the sea. By 1346 two thirds of the town and its buildings had been lost to the sea, and the people that remained were no longer able to make a living by trade, or to pay the tolls and tithes that had been levied upon them. Between 1349 and 1360, the sea completed its destruction of Ravenser Odd. The erosion exposed the bodies buried in the chapel’s graveyard, much as it was to do some 450 years later at nearby Kilnsea and Owthorne where the bodies were re-buried in the churchyard at Easington. The final days of Ravenser Odd saw scenes of looting and panic-flight, when the town ‘lay open to devastation ... [with the] floods and inundations of the sea ... surrounding it from every side like a wall, thus threatening its imminent annihilation. And so with the terrible vision of waters seen on every side, the besieged persons ... preserved themselves at that time from destruction, flocking together and tearfully imploring grace.’ And so ended Ravenser Odd. The destruction of Ravenser Odd was quite dramatic. But most of the other lost villages of Holderness probably slipped slowly over the edge. Easington is a medium-sized village which nestles in the south east corner of Holderness, East Yorkshire. It is situated about ½ kilometre from the North Sea on its eastern side and two kilometres from the river Humber on the south. According to the Domesday survey of 1086 - in Esinstone, Morcar had fifteen carucates of land to be taxed, and there may be there as many ploughs, Drogo has now there one plough and thirteen villanes and four bordars, three ploughs and 100 acres of meadow. Archaeology has revealed an even more ancient past, with the discovery of four graves and the near complete burial of a horse, thought to be of a late Iron Age date (c. 200 BC) in a settlement just adjacent to Dimlington. A few years ago a Bronze Age barrow (i.e. a burial mound) close to the sea, dating from around 2000 BC, and thought to be the grave of a leader/warrior was found. A large jet button, possibly a clasp of his cloak, was unearthed. These finds prove conclusively that the district has been inhabited for a very long time. The Square (or market place as it was once called) provides a large focal area in the centre of the village. There used to be at least three shops in the village although at present the village has a shop situated within the Marquis of Granby public house. At the edge of the Square is the former grocer shop, the building sits on the old site of Overton Hall, a large manorial type of structure that was in existence in the 1600s but was demolished in about 1887. At present there are two public houses in the village. In the 19th century at least two other ‘beer houses’ were recorded, and a third closed in 2013. Easington once boasted a windmill: a mill was recorded in 1260 and a mill was operational until the late 1920s and was only finally dismantled in the 1960s. A school and school-house has been present in the village since 1860, with various additions over the years, the original was closed in 1992 with the construction of a new school building in High Street. The Coastguards were present in the village from as early as the mid-19th century, and somewhat later a row of houses was built in 1905 specifically for their use. They maintained watch along the coast from Spurn and Kilnsea, and were backed up by auxiliaries in the form of L.S.A. (Life Saving Apparatus Company) who used a rocket and breeches buoy for mariners in distress. The full time Coastguards left Easington in the late 1980s, but a contingent of auxiliaries continue to maintain their presence with patrols and watch keeping from then until the present da. Easington has been a fairly self-sufficient village in the past, with a variety of trades flourishing within it. At various times butchers, grocers, drapers, shoe-makers, straw bonnet makers and milliners, blacksmiths, tailors, wheelwrights, coal dealers, builders, a surgeon and even a taxidermist have all been recorded in directories. The predominant occupation of the area has been agriculture, but a certain amount of fishing was also carried out. A Royal National Lifeboat Institute lifeboat was stationed here from 1913 to 1933. A caravan site with lodges, and both static and touring caravans has been in existence on the road leading to the beach since the mid-1960s. This is perhaps the oldest building in the village with the exception of All Saints Church, it is believed to have been built at some point during the 14th century. The structure on the barn is four and a half bays long with storage bays flanking a central bay in which threshing was done. The aisle and gable walls are of brick (not original). 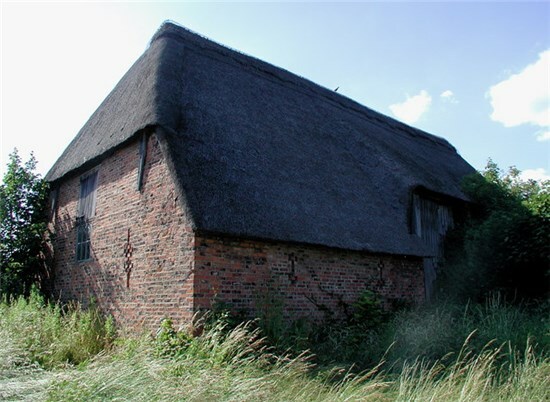 The roof is thatched with Norfolk reeds and it is hipped at both ends with collars and ties supported on a plate. The barn is the last example of the Holderness traditional timber and thatch building, behind the barn is an octagonal horse walk in brick. A round house or engine shed was added at some time, probably in the 19th century. Until the 1980’s the barn was used by the village hosting plays, and the occasional wedding, before that it was used as a war museum. In 1987 the barn was granted Grade II listing. Robin Skelton (12 October 1925 – 22 August 1997) a British-born academic, writer, poet, and anthologist. Born in Easington, Yorkshire, Skelton was educated at the University of Leeds and Cambridge University. From 1944 to 1947, he served with the Royal Air Force in India. He later taught at Manchester University where he was a founder member of The Peterloo Group. In 1963, he emigrated to Canada, and began teaching at the University of Victoria in British Columbia. Skelton was an authority on Irish literature. He is well known for his work as a literary editor; he was a founder and editor, with John Peter, of The Malahat Review, and a translator. Known as a practising Wiccan, Skelton also published a number of books on the subject of the occult and other neopagan religions. Georges Zuk, a purported French surrealist poet, was a heteronym created by Skelton. The Easington Terminal opened in March 1967, run presently by Centrica, and is one of six main gas terminals in the UK. Easington became the first place in England to have a gas terminal, where the pipeline came ashore on its doorstep and the village has recently received gas from Norway via the world’s longest under-sea gas pipeline. When the terminal initially opened there was a belief that the useful life would be over before coastal erosion became an imminent threat. Gas reserves proved greater than expected, increasing the terminal’s life, meaning that protection was necessary, a kilometre long revetment using over 130,000 tons of rock was constructed in 1999, this section of defences had to consider two nearby sites of SSI – Dimlington Highland and Easington Lagoons. The construction of the revetment has enabled beach sediment to pass freely along the defenced section and both the SSI areas are monitored. In addition to the gas terminals, there is also a wind turbine farm just to the north, so the area does indeed rate as quite a concentrated energy coast line. Kilnsea is a small triangular settlement, at the tip of South Holderness. It is bounded on the east by the North Sea, on the west by the River Humber, and on the north by the village of Easington. As the land narrows to the south it merges into the Spurn peninsula. Kilnsea has lost, and is still losing, land to the sea. The soft boulder clay cliffs crumble away, and the annual loss varies between one and three yards (or metres) annually. Even on the western side of the parish some loss of land is experienced, though only when westerly gales coincide with tidal surges in the River Humber. When it was recorded in the Domesday Book (1086), Kilnsea village was several miles from the sea, and the dwellings of the village were established upon a hill. By the late eighteenth century the village was still intact, though it had lost its East Field. Around the houses and cottages were little gardens and small fields, with a village pond and a green, and a medieval church. Apart from the church itself, a large ornate stone cross was the most prominent landmark. It had apparently been erected on the peninsula further south to commemorate the landing of Henry IV at Ravenser in 1399, but was removed to Kilnsea in the early sixteenth century when the peninsula eroded. New farmhouses, cottages, a pub, and a small church began to appear on the western side of Kilnsea from the late 1840s. The practical villagers of Kilnsea dismantled their houses and cottages before they fell over the cliffs. Building materials were precious, and were saved from the sea where possible. Soon after the enclosure award had been signed in 1843 the new village of Kilnsea began to appear, mainly built on the Humber side of the parish, as far away from the sea as possible. The houses may have been new, but they utilised some of the material from the old houses, whilst the names of many of the families preserved the continuity of the old village. Farming and fishing were the main occupations of the people of Kilnsea, and like Easington to the north certain families have dominated the area: the Clubley, the Tennyson (alternatively Tennison), the Medforth, and the Hodgson families, were the most prominent in the nineteenth century. It was said that had it not been for sailors getting marooned in the village when their ships got into trouble the people of Kilnsea would be very inbred indeed, for they could not be bothered to get over Long Bank (the parish boundary) to go and look for partners! Before the loss of the village, Kilnsea had several alehouses, shops, and even a school. After the new village was created it never got larger than about 30 houses, though it did manage to retain two public houses, the Blue Bell and the Crown and Anchor. The former closed in the 1950s, but the latter still flourishes. However there was no rush to build a new church. After the church went over the cliff, services continued to be held at Kilnsea, though for weddings, baptisms and burials the people of Kilnsea had to go to Easington. As a temporary measure, a room in a farmhouse was rented, and the rescued church bell was hung in the stackyard, being struck with a stone to call people to worship. Eventually the bell cracked from such harsh treatment, which rather quashes romantic fables about Kilnsea’s bells ringing under the sea! John Ombler, of Westmere House, who became the Board of Trade superintendent of the Spurn beach and sea-defence works, was apparently the last person to be baptized in the old St. Helen’s and it was to a large extent due to his efforts that in 1864 the decision was made to build a new church at Kilnsea. The Diocesan Society contributed £102 to the building of the church, and subscriptions were also raised locally. The celebrated Victorian architect, William Burges, designed a building of red and yellow brick, which was erected about three-quarters of a mile west of the former site. Superficially the new church, which cost £500, bore no resemblance to the old, but Burges, with a proper respect for tradition, used stones from that church for the foundations, the buttresses, and the coping. Furnishings and fittings from the old St. Helen’s soon began to find their way back. The medieval font was rescued from Skeffling, the holy water stoup from the Crown and Anchor, the church registers were brought back from Easington, and services resumed on a regular basis. Sadly in the 1990s falling congregations meant that the church had to be closed. It has now been deconsecrated and is being converted to a dwelling. For a time Kilnsea also had a Primitive Methodist Chapel. Henry Hodge, a Hull industrialist, had been born in Kilnsea, and he became a prominent Primitive Methodist. Finding that the village of his birth was without a Methodist place of worship he bought land near the Humber and in 1885 built a chapel, constructed of corrugated iron there. This so-called ‘iron chapel’ remained in use as a place of worship until it was converted into a cottage about 1917. In December 2013, as a result of the North Sea surge, the western side of Kilnsea was badly flooded. Thanks to the efforts of many local people the Environment Agency agreed that a flood bank should be constructed, and it was completed in April 2015. Nevertheless the area will always be vulnerable, being almost entirely surrounded by water. Out Newton is a small hamlet of some 600 acres in the parish of Easington located approximately one and a half miles north-west of the village of Easington. It consists of a few scattered dwellings including four farms, and has a population of around twenty. Apart from an area occupied by a wind farm consisting of seven wind turbines the remaining land is given over to arable farming. As elsewhere along the south Holderness coast, Out Newton is and has been historically subject to severe erosion by the sea. Out Newton is first mentioned in 1066 when one, Ligulf was recorded as holding five carucates of land comprising Out Newton Manor. In 1086 in the Domesday Book the Manor was said to be in the hands of Drew de Bevrère. Thereafter there are numerous references to this manor recording its successive changes of ownership. The parliamentary enclosure of Out Newton took place in 1757, some 14 years before the enclosure of Easington. A pre-enclosure map depicting the field patterns immediately before that date shows that Out Newton then consisted of a West Field and East Field of approximately equal size and covering most of the area and a very much smaller North Field, which seems to have been drastically reduced from its original size by erosion, as well as a central strip of garths and closes resulting from earlier enclosure activity. After enclosure much of the land fell into the hands of the well-known East Riding landowning family of the Harrisons and Harrison-Broadleys who remained as the major landowners of Out Newton throughout the 19th century and until 1914. In the medieval period a chapel was erected at Out Newton. It was first mentioned as early as 1302 and in the 16th century, its chaplain was recorded as receiving a stipend of £4 a year from the vicar. In 1552 it was said to have a silver chalice and to be furnished with two bells, however by the middle of the 17th century it had fallen into decay and was annexed by Holmpton. The building itself must have been a sturdy one for it lasted albeit in a derelict state until its last wall was pulled down in 1911 when it was less than 10 yards from the sea. A photograph of the ruined chapel appears in Thomas Sheppard’s book, Lost Towns of the Humber. As well as a chapel, the hamlet is known to have had a windmill in the medieval period as there is a mention of one both in 1276 and again in 1350. In the mid-19th century Out Newton boasted an alehouse although it seems to have been a short-lived affair. It also had two poor houses at about the same time as they are recorded as being there in 1842 presumably as a result of Out Newton’s joining (with Easington) the Patrington Poor-Law Union in 1836. The character of Out Newton as a sparsely populated farming community has changed little through the ages. Although the present population of around 20 people is probably one of the lowest, the figures for earlier years are not markedly higher with the highest being 69 in 1821; figures for other years show little variation — 35 in 1801, 36 in 1901 and 31 in 1931. On Sunday 3rd January 1943 about 7.20 p.m. the war came to Out Newton when according to the Chief Constable’s official report to Northern Command headquarters in York “a German plane — Dornier 217, carrying a crew of four, after being struck by Anti-Aircraft fire, tried to fly out to sea, but returned inland and crashed landed in a field in a sparsely populated district in the neighbourhood of Out Newton, a short distance from the coast leading from Withernsea to Spurn Point. No one was present when the aircraft landed and the plane was completely burnt out presumably after being set on fire by the crew. Private Leonard Medforth, Home Guard, a farmer residing at Southfield Farm, Out Newton, was off duty at his home, and, on seeing the crash in the distance, he immediately put on some of his military uniform and turned out alone, unarmed, to search for the members of the crew. In a lonely country lane about half a mile from the burning plane, he met the four German airmen whose ages ranged from 21 to 26 years, each armed with a 7.65 automatic pistol fully loaded, a spare loaded clip for each pistol, jack knives, and verey pistols. No resistance was offered by the German airmen and he promptly arrested them and took them to the farmstead of Tom Findlay, Southfield Farm, Out Newton, where in the presence of the farm foreman, Charles Blythe, he detained them until the arrival from Withernsea of my Inspector Burton, who took charge of the prisoners. Private Leonard Medforth was a member of the secret resistance army, the Auxiliary Units, who were formed to delay and sabotage the German forces should they have succeeded in occupying Britain. In Alan Williamson’s East Riding Secret Resistance, Medforth is listed as a member of the Skeffling Patrol. Later that same year, early in the morning shortly after midnight on 22nd September, a second German bomber crashed at Out Newton, this time at Threefoot Lane in a field belonging to Mrs. Hodgson of Skeffling.This plane, too, was a Dornier 217, part of a flight that had taken off earlier from German-occupied Holland on a night-time bombing and mine-laying mission. Its pilot had approached the coast at an estimated altitude of only 50 feet in order to avoid the coastal searchlights at Kilnsea and Spurn but was unlucky enough to be picked up almost immediately by one of them and then held by the beams of several more. He launched a machine-gun attack on one of the searchlight emplacements but flew too low and struck the ground at a shallow angle. The crash occurred about a quarter of a mile from Southfield Farm in Out Newton with the plane breaking up into several large pieces and coming to rest about 250 yards from the point of impact. All four members of the crew died — the pilot Fw.Helmut Rumpff, his observer, Fw. Siegfried Vomweg, the wireless operator, Gefr. Arno Ehemann, and the gunner, Obgfr. Kurt Stiegler. When the broken-up plane came to rest, it did not catch fire but among the debris were two large 1,000 kg. G-type unexploded parachute mines. A team of Royal Navy mine disposal experts were called to the scene and attempted to defuse the mines. Unfortunately one of the mines exploded injuring the three men in the team; they were taken to hospital but two of them, Lieut. Commander Peter Tanner and Able Seaman Percy Fouracre both later died of their injuries leaving Lieut. Frank Price as the only survivor. The bodies of the crew of the Dornier were later buried in Hull North Cemetery. In the face of considerable opposition, culminating in a public enquiry, a wind farm of seven turbines (a scaled-down version of the original proposal) was created in Out Newton. Commissioned in March 2002, the wind farm took a year to construct. It consists of seven turbines each 49 metres in height from the hub and 80 metres to the tip giving a total power of 9.1 million watts, enough it is said at full power to generate electricity for nearly 6,500 households.